Above are two advertisements that make the same mistakes many marketing materials, whether B2C or B2B, make. By looking at them closer, we can learn from their mistakes—and hopefully not make them ourselves. First, let’s look at the “Microliving” advertisement at the very top. I sort of like the “Think Inside the Box” tagline—it takes a cliché and flips it on its head. It takes something that seems to be a negative and makes it a positive—I assume. We don’t know that for sure because of what’s missing in the billboard: There’s no stated benefit to “thinking inside the box.” Why would you want to think inside the box? That’s constricting and probably boring. 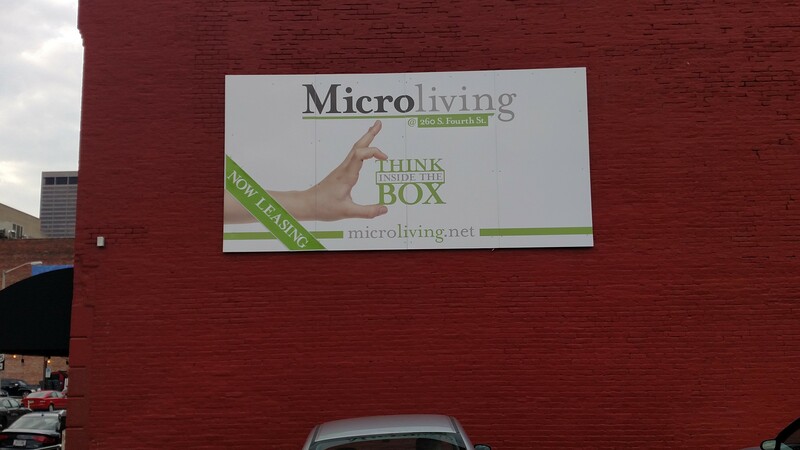 Add to that the website address: microliving. Why would you want to live micro? Now, possibly you’ve experienced life living in the heart of a big city, and you enjoy that. You’re close to the bars, the restaurants, the fluorescent bowling lanes, the sports venues. And you know that the drawback of living in downtown is that apartment rental prices are out-of-kilter given what you get for the price: a high price with a little space. But why play on the assumption that people will know that trade off? Better yet, why assume they’ll see the value in staying at your apartments? What makes your apartments to special? Is the price better? The location? The view? From this ad, I have no idea, so I have no idea why I would want to “think inside the box.” I could go online to learn more, but this ad doesn’t even pique my interest enough to convince me to do that. With your marketing materials, be sure to address the benefits buyers will experience from your product/service/solution. Put that up near the top (frequently, right after you talk about their pain points that this product will help them solve). Talk about benefits before features—or, better yet, incorporate features into the discussion of the benefits. But make sure you talk about benefits. In a space-limited ad like this billboard, including pain points, benefits, and features would have cluttered up the ad, and nobody would have read it. But there’s still room to list one major benefit (the biggest), or maybe two. People don’t care that you’re selling a product. They care what that product does for them. Tell them—up front and boldly. Now, the ad in the second picture doesn’t quite have the same problem. The benefits aren’t explicitly stated, and I would re-write it to do that, but there is a benefit: People will see your ad! However, while thousands of people a day see this ad, how many of them will be looking for the product/service/solution you sell? 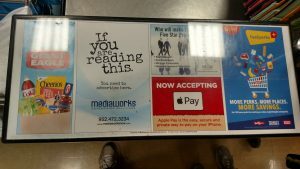 This was on the counter at a checkout stand at a local grocery store. Certainly, there are some products that would fit this ad: gum, cleaning products, diapers …. But those are mostly things that you should already have gotten. It could be a good reminder, but not a good ad. What about a new vacuum cleaner? Or a new car? Maybe, but not with enough frequency to make your investment in the ad pay off, most likely. More to the point, very, very few of the people who come through this lane and see the ad for ad placement will have any need to advertise anything. It’s the wrong audience. When you create advertising/marketing materials, make sure you aim them at the right audience—and again, be right up front and bold about declaring who that audience is. Use that information to decide what kinds of marketing materials to create, and where to place them so that more of your target audience will see them. Include them (their pain, their needs, their daily challenges) into your marketing materials. That will create a better connection—and a stronger need—within that audience for your product/service/solution. Marketing is hard enough. Give yourself every advantage by strongly targeting your ideal or natural prospects, and then tell them why they should give a damn. If you want to give yourself another advantage by incorporating storytelling into your advertising, let me know.